We all know the VR market is still in its early days, and this gives an incredibly interesting view of the emergence of new distribution methods for this medium. Numerous “Netflix of VR” platforms are currently competing head to head, but maybe a different model altogether will win out in the end? Only time will tell. However, in the meantime it is easy for 360º video producers to lose track of what their options are when it comes to distributing their content. That’s why we created this article and the complementary infographic to shed some light on this situation. Let’s quickly cover them in order. Open platforms follow the traditional video hosting platform model, and include YouTube and Facebook, as well as 360º only video platforms like GoPro VR (previously called Kolor Eyes) and Littlstar. 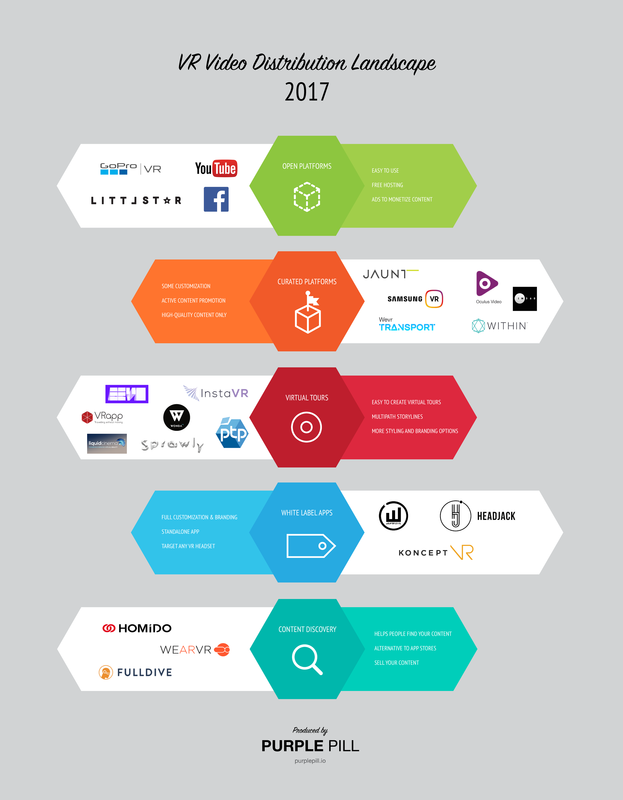 A big name that is missing here is VRideo, one of the very first 360º video hosting platforms to appear on the scene, who had to close shop in November of 2016. The major benefit of using these video platforms is that they are free and easy to use. On top of that, YouTube and Facebook have the benefit of allowing you to show ads alongside your content to monetize it. By far the biggest downside of this approach is that you will have zero options to customize your experience. It is mere video hosting. Also, many of these platforms only work on certain VR headsets, which limits your potential reach. And you should take into account that the vast majority of people who view 360º video on Youtube or Facebook do so in fullscreen mode, without a VR headset, which obviously does not give them the full experience. Next up, curated platforms, which we sometimes refer to as channel-in-app distribution. A great example of this model is Jaunt, who have an app live in the app stores, and if they accept your content, they will create a channel inside the Jaunt app where your content can be viewed. There is some form of customization possible with the Jaunt SDK for Unity to style and brand your channels. Jaunt and Wevr also actively promote the content they host, so you can be assured you will get some serious eyeballs. All these platforms are curated and will not accept just any content, so your content will be shown alongside other great content. On the other hand, these platforms sometimes have restricting terms of service. Besides Jaunt, the other platforms offer no options to customize your channel apart from changing a thumbnail image. Another downside is that Oculus Video is only available for Gear VR and Oculus, while Samsung VR is only available for Gear VR and web, so you’ll have fairly limited reach with those platforms. WITHIN and IM360 only host your content if you work with them, which is also the model Jaunt used to follow, but Jaunt decided to go for a more open approach now. There has been an influx of distribution platforms who focus on making 360º experiences interactive by allowing users to easily add “hotspots”. Looking at- or clicking on these hotspots, additional information can be displayed, or a new photosphere or video can be loaded. These distribution channels are ideal for real-estate agents who want to create virtual tours through a building, or for producers who want to create multipath storylines. With most of these platforms it is possible to change background images and menu layouts, thus giving you a bit more options to style and brand your experience. Not all VR headsets are supported yet on most of these platforms. And while EEVO and Liquid Cinema look promising, they are still in closed beta. With Wonda VR you will get a channel inside their app. And because these platforms offer more advanced functionality, they are not free to use, but either charge a flat fee or a monthly fee. We just covered a ton of platforms that allow you to distribute your cinematic VR content, and it depends on your project which one will fit best. But what if none of them fit your project? What if your A-level client is looking for a fully branded experience, which works on all VR headsets and which contains highly customized menus and functionality? In that case your only option is to create a custom VR app. Luckily there are more and more app development agencies who offer these services, and two of the most renowned parties are Wemersive and Koncept VR. Allows for full customization of the VR experience, including branding, custom functionality, and interactivity. You will also get a standalone app, instead of a channel inside someone else’s app. A custom app also allows you to target any VR headset. Creating a custom app is time consuming and very expensive. You’ll be going back and forth with the developer for weeks if not months before your app is finally finished, and the costs will easily be several thousands of dollars for a simple app. At Purple Pill we created an alternative, which is both fast and affordable, while still allowing full customization and branding. We call it Headjack. Headjack is an app creation and content management platform for 360º video producers, which allows you to create white label, multi-platform VR apps in minutes instead of months, and without writing a single line of code. Unless you like programming of course, in which case you’ll enjoy browsing the elaborate API documentation. Content discovery is an interesting category which is slightly different from the other ones in this article. The main difference is that these platforms don’t host the content themselves, but mainly provide a central portal where you can search for and find interesting VR content. They then simply link through to a page in the Google Play store, for example. So to sum things up, there are a ton of ways you can distribute your VR video content, and none of them is perfect yet. The platform you select highly depends on your goals, time and budget. We hope this article at least gave you an overview and some handles to aid you in making the right decision for your specific project. If you want to share your thoughts or think we missed a distribution platform in our list, please let us know in the comments below! Very helpful, thanks for publishing this!